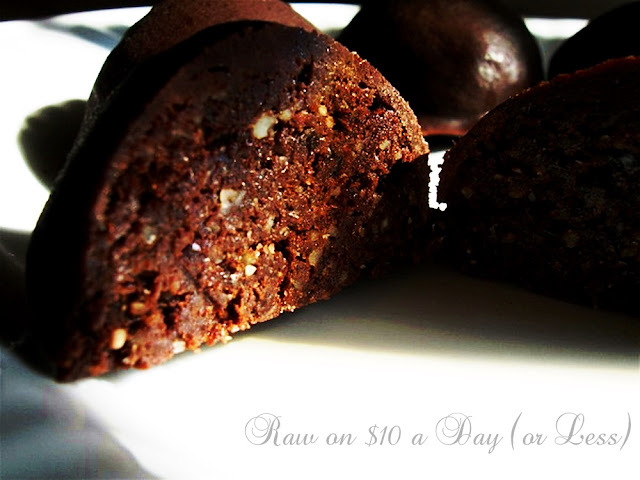 Raw and vegan foods are really no different from (or more complicated than) any other type of foods, though, and a few meals can be pulled together if there are a few staples available. This doesn't contain any actual cereal grains, but does give that same feeling of nice big bowl of cereal and milk. The milk is even sweet and drinkable when finished. 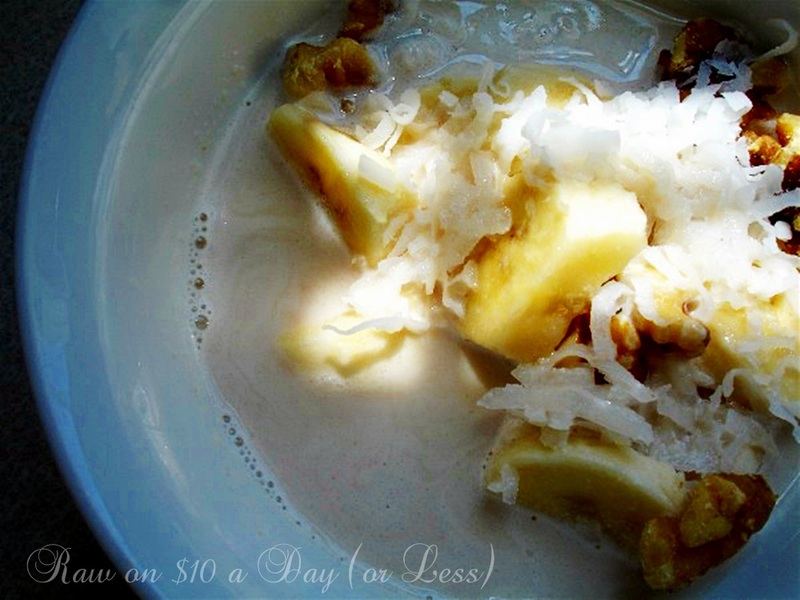 Layer the banana, nuts, and coconut flakes in a bowl. Pour in almond milk. Top with pinch of cinnamon and an optional teaspoon of agave or other sweetener. This is a very hearty and filling salad. 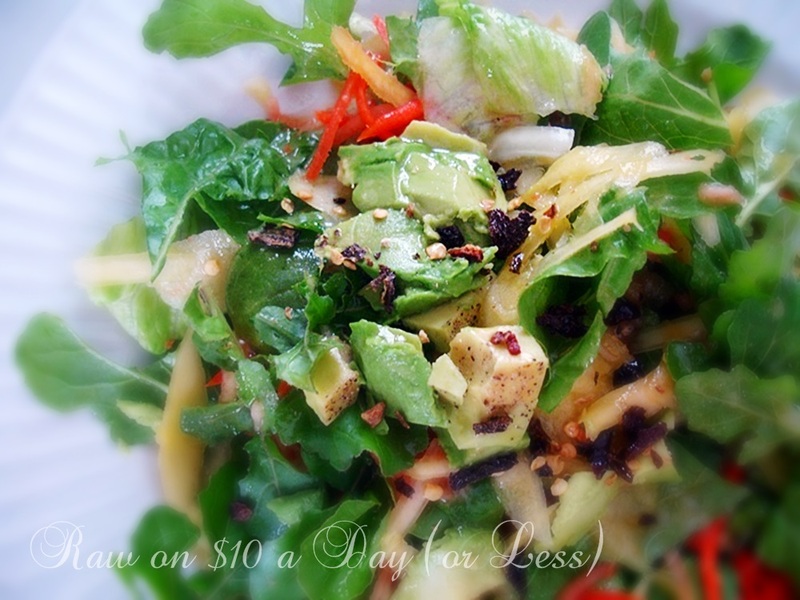 When I made this, I found the non-organic lettuce on sale for a terrific price. You may find prices higher in your area. These are so simple to make for an easy dessert. In a food processor with an "S" blade, process the raisins, nuts, cacao, vanilla, and salt until the mixture starts to stick together. Using a rounded spoon, form eight truffles. Put in the freezer to chill for at least a half hour. Make the chocolate coating by melting the coconut oil and adding to the agave and cacao powder. If this becomes stiff, just warm again slightly in a barely warmed oven. Spoon the chocolate over the bottom of the truffles. This should set up almost immediately as the sauce contacts the cold truffle. Then spoon over the top, letting it cool to set. The chocolate sauce will harden into a semi hard shell over the truffles for maximum chocolate impact. Raw on $10 Meal Plans! Over and over, I've heard that individual recipes are a snap, but that an organized meal plan would guarantee raw food success! I've found this to be very true for myself. 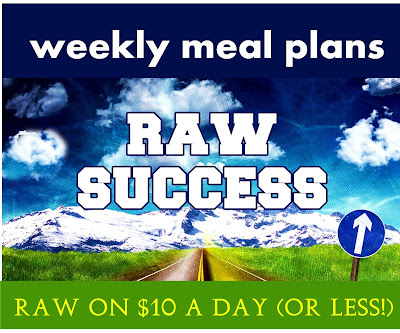 Raw on $10 Meal plans will debut on Friday, March 22nd. Every Friday at noon, there will be a different meal plan for the following week. 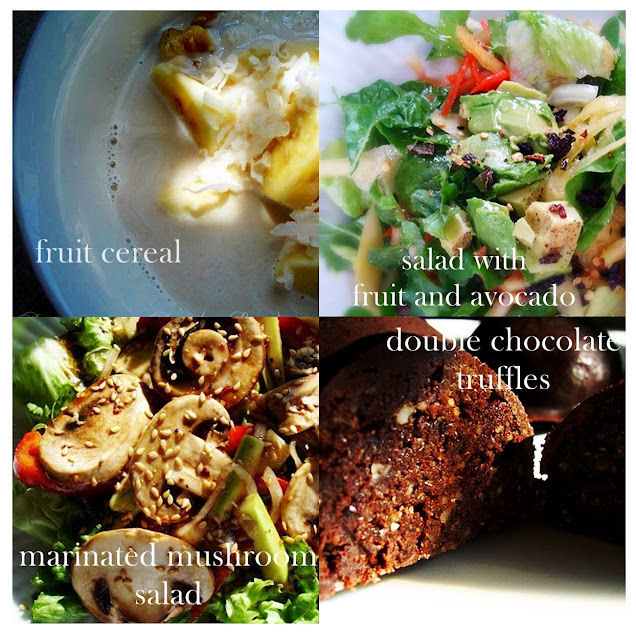 To help in your raw food journey, meal plans will include a shopping list, a recipe for three meals and a dessert for each day of the week, as well as snack ideas to up the calories if needed. That way, each meal plan can be customized for your unique body type, appetite, and activity level. I'll have some new recipes in each week's meal plans that focus on simple but delicious foods that are easy to plan and simple to prepare as well as a special dish or two. I'll have a more details later in the week! I always fall for your salads! OMG these truffles!!!! :-)) fantastic! Meal plans would be amazing!! They've been really helpful for me! Thanks, Katrin & Julie! I visited your blog as well. Nicely done! Great recipes today. 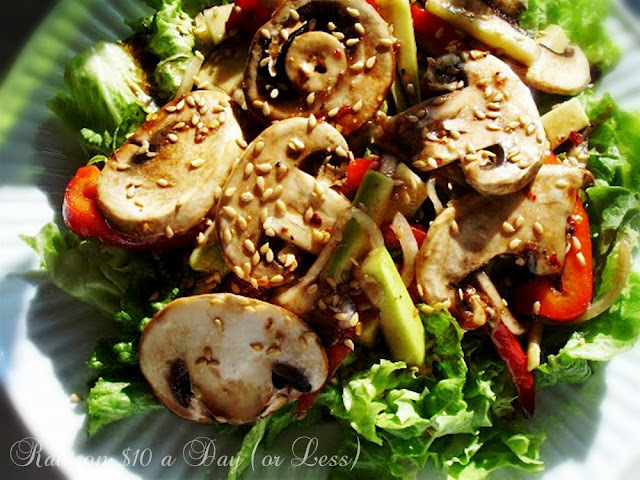 The marinaded mushroom salad and truffles will definitely be happening. I love your meal planning idea. Organization is key to this lifestyle and that will be a great tool for many! Thanks, Kathy! I've found having a meal plan has been really helpful in keeping me organized! very excited about the meal plans! 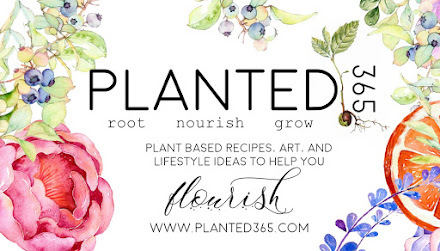 What a helpful way to start getting into a raw lifestyle!